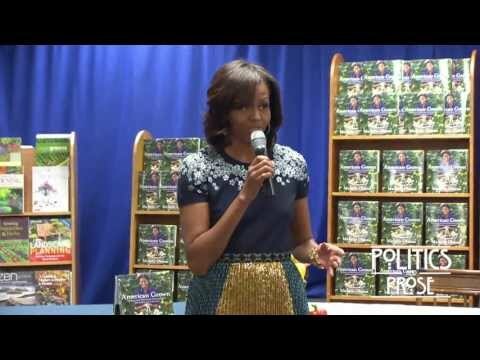 First Lady Michelle Obama Discusses Her First Book "American Grown"
Home books Michelle Obama First Lady Michelle Obama Discusses Her First Book "American Grown"
This week, First Lady Michelle Obama stopped by a DC book store to sign copies of her first book American Grown: The Story of the White House Kitchen Garden and Gardens Across America The book traces the history of the White House garden and community garden's across the country. Listen to what Mrs. Obama had to say about the venture and pick up a copy of American Grown: The Story of the White House Kitchen Garden and Gardens Across America. Thank you for coming out on this wet Tuesday. Not so good for standing outside but really good for gardeners. This is my second book signing. As you recall, when the book came out I was in the middle of a campaign. This is my first book. What a great first book to be able to tell the tale of the White House garden. I want to thank the host Lissa and Bradley who are the owners of this bookstore. That's also a part of what this book is. It's not just about the White House garden. Community gardens are not unique. They're mainstays across the country. There's a community garden across the street from where I grew up. I didn't even realize that until I started doing the research. Community gardens are an important part of history of this country. My purpose of this book is to share the history of the White House garden. Millions of people don't get a chance to come to Washington. They hear about the garden, but they don't get a chance to see it. We also wanted to use it as a way to talk about one of the issues that's important to me that is ending the epidemic of childhood obesity. How do we begin to educate our children to learn about how what they eat impacts their body? All that is a part of this book. There are beautiful pictures of what happens inside. They are great stories and recipes. It's doing a lot. My girls wanted to look at the pictures, but slowly and surely they began to read it. Another important thing about this book is all the proceeds go to the National Park Foundation. That's really critical because it will help support the White House kitchen garden and other community gardens across the country. It's Mother's Day and hopefully you'll share it with your family and friends. I am just proud to be the first lady of this country thank you so much.